My favourite piece of paper money is worth nothing. I was in a flea market and stopped by a table with stamps and coins. There was Japanese occupation money. There was German inflation money. For sentimental reasons I bought a beat up coin from Newfoundland with no numismatic value. I love Newfoundland. I am sad that they gave up their independence in 1949. I like lots of little countries with their own stamps and money. If I could turn my garage into an independent country, I would probably do it. The one piece that caught my eye was a piece of money printed on cheap paper. It had Chinese writing and a picture of Josef Stalin. I turned it over and it said "Hell Bank Note". I laughed so hard that I almost cried. I bought a couple of the pieces. At work I showed them off to Russian co workers. One older lady had lived under Stalin as a child. She hated him almost as much as Hitler. Like many Jews from the former USSR, she believes that Stalin would have tried to wipe out Soviet Jews had he lived longer. 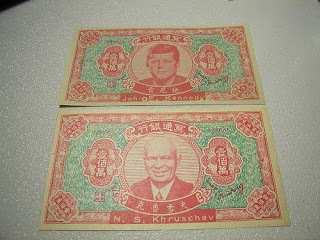 I assumed that the "bank note" was an odd piece of political satire produced by anti communist Kuomintang. (Chinese nationalists) I kept one of the banknotes in my wallet as a joke and forgot all about it. One day, I had a meeting with my son's guidance counselor, who was from Taiwan. As the meeting drew to a close, I took out the "funny money" and asked him about it. He told me that it was not meant to insult Stalin at all. I was disappointed, but I asked him what he meant. "It's ghost money". he told me. When Chinese people visit the graves of their ancestors, they bring special paper money and burn it on an altar so their ancestors will have money in the next world. When the Christian missionaries came to sell Christianity to the Chinese, they told them that Chinese who didn't accept Jesus would go to hell. Because of the language barrier, the Chinese took this not as a threat of damnation but as a simple reference to the after world to which departed souls go. In their understanding, "hell" is not a place of torment but simply a name for the next world." Hell Bank notes are a modern adaptation of an old Chinese custom of burning money for the use of the dead. The custom is still widespread The absoluteastronomy.com. site explains the customs surrounding them as follows. ".....there are considerations concerning the use of Hell Bank Notes that some Chinese people take seriously. It is not advised to give a hell bank note to a living person as a gift (even as a joke); it is often considered as wishing the person's death, which is a grave insult. Hell bank notes are usually kept in places nobody can see (e.g. cupboards), as having these notes around in the house is considered bad luck. When burning the notes, the notes are treated as real money: they are not casually tossed into the fire, but instead placed respectfully in a loose bundle. Alternatively in some customs, each bank note may be folded in a specific way before being tossed into the fire. This practice is an extension of the belief that burning real money brings bad luck." The custom goes beyond money. At Chinese funerals, it is not unusual to see papier mache cars, houses and other amenities burned for the benefit of those in the after life. Absoluteastronomy gives an idea of the extent of this custom by reporting on communist Chinese efforts to put limits on the custom as follows. "In 2006, China's deputy minister for civil affairs, Dou Yupei, said he intended to ban at least the more extreme forms of joss paper, such as MP3 players, planes, boats and even paper condoms, paper prostitutes and Viagra." I was thankful for the new information, although a bit disappointed. To me, Stalin's picture belongs in Hell, just like he does. My adapted use for the joss money I found in the flea market was a lot like the women of Bolivia. When an Englishman came to Bolivia in the 19th century, he tried to sell the men bowler hats such as the kind made famous by Charlie Chaplin. The men had no interest in the hats, but the women were crazy about them. So the dry goods salesman unloaded all of his hats not on the men but on the women. I detected the same amusement in the eyes of my son's guidance counselor as must have been seen in the face of the English hat salesman of many years ago. We were looking at the same object and seeing completely different things. It has been a while since I have been back to the flea market. When I pick up an old book, an obsolete banknote or a toy from my childhood, it is like touching hands with the past. When I buy such things as a Newfoundland coin or Chinese ghost money, it is not an object that I am buying but the dreams that go with them. With the the right questions, every place you walk is a museum and every friend a teacher. I enjoyed this post! Fascinating stuff. I love the accent though I sometimes can't understand some words but the people themselves are amazing and warm.